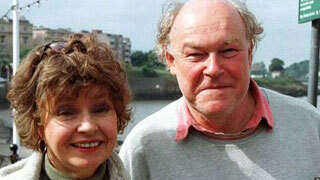 I heard some sad news recently about one of my all-time favorite Afternoon Tea actresses; Prunella Scales. 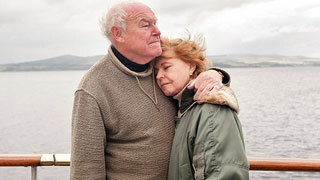 According to her husband of over fifty years, actor Timothy West, Scales is suffering "a sort of mild Alzheimer's". Scales, who is probably best known to American audiences as Sybil in Fawlty Towers, isn't letting her failing memory get the better of her though and the 81-year-old actress intends to keep on working. 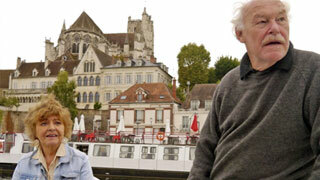 In fact, she's been appearing most recently on British television in a four part television documentary series called Grand Canal Journeys, The series, which also stars her 79-year-old husband features the couples' travels on four canal journeys across Britain and through France's Burgundy wine region. Canaling is something Scales and West have enjoyed since the 1970s when they borrowed a friend's boat for a couple of weeks. They loved the experience so much that they took it up as a hobby. According to West the canal journeys are perfect for his wife because "you don't have to remember things on a canal". Back home, where they live in a tall, thin building for instance, Scales says she seems to spend all day running up and down the stairs looking for her spectacles. Something, of course, which is not a problem on a canal barge. Instead of stairs though, Scales finds herself running up and down the towpath opening the locks and checking out the wildlife, while West steers. Although her memory may be faltering, Scales is still physically very fit. In fact, West confesses that "when she's so agile leaping about the locks," he sometimes forgets how old she is! Making the documentary was a much needed chance for the couple, who celebrated their Gold Wedding Anniversary last October with a trip down the River Thames on a paddle steamer, to take a break from worrying about Scales' condition. The couple aren't, however, afraid to talk about Scales' memory loss. For many years, they've both been big supporters of the Alzheimer's Society and their televised canal adventure is testament to the fact that people with dementia can still enjoy life. If you have a favorite Afternoon Tea actor – past or present – that you'd like to know more about, drop me a line and I'll see what I can find out.